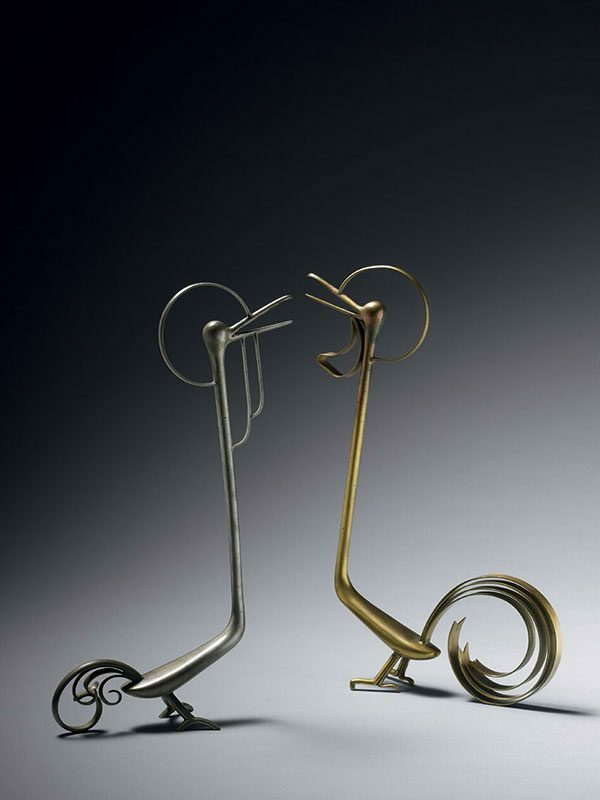 Two abstract metal sculptures of stylised birds, each depicted with long necks, open beaks and two feet. The tail feathers are widely curled and each bird has a halo around the head. One sculpture is silver-coloured, the other yellow metal. The yellow metal bird is signed Katou Sougen. The birds are contained within the original wood tomobako. Katou Sougen (1899 – 1995) was born and grew up in Kyoto. He learned metal work from the early age of 13. He founded the metal work group Kingeikai. Sougen exhibited many times at the Nitten exhibitions.